At 1 o’clock last Thursday afternoon, the seats in the Senate Finance Committee room started going fast. On the agenda: A bill that would require drivers for next-gen ride services such as Uber to carry more insurance. The discussion had played out in committee rooms throughout the Statehouse during the last four months. But any bill with a tax, fee or affecting the state’s revenues has to pass through Finance. At the end of a legislative session, nearly all of the most significant debates make their last stop here. Often, time is short and the committee is new to the topic. That means that lobbyists must be prepared with a honed elevator pitch supporting their legislation. And subsequently, any bills that have been in the works for months, or even years, can die or take a dramatic turn here. “It all happens in Senate Finance,” said Jamie Feehan, a lobbyist with the firm Primmer Piper Eggleston & Cramer, who grabbed a seat in the room Thursday to represent the Property Casualty Insurers Association of America. But make no mistake, this is where Cummings wants to be. She chaired Finance for 10 years, then was marooned on the Education Committee for four years before winning a place this year back in the center of the action. Lobbyists can’t afford not to be in Cummings’ committee room in the final days of the session, often making for some cramped, heated quarters. Some days, enough lobbyists to field two football teams pack themselves into the 16-by-18.5-foot space at the end of the first-floor Statehouse hallway (yes, your trusty reporter measured the room with the help of lobbyists during a break in the action on Friday). The iPad-carrying, suit-jacketed lawyers, bag-toting news reporters and a smattering of state employees will jockey for the precious 15 or so seats. Latecomers will settle onto the wide windowsill behind Cummings. Others will stand crammed in the corner, cringing every time somebody opens the door. Still more often linger outside in the hallway. Thursday offered just a hint of what the action is like. Representatives of Uber, archrival Lyft, traditional taxi companies, trial lawyers who might someday take an errant driver to court, and insurance companies filled the brown folding chairs that ring the committee room table. Some of them would take the witness chair to offer their clients’ point of view. Others would remain quiet, choosing to buttonhole legislators later. The changing cast of characters makes sitting in the room a little like a bus ride. Every time the committee shifts conversation to a new bill, a new set of “riders” gets off and on the bus. At key times, it will be standing room only. It’s not always clear who’s driving the bus. Cummings is in charge, but after checking with Senate leaders, the committee’s direction can change abruptly. Some in the room Thursday afternoon had no stake in the bill at hand. Candace Morgan, a staffer at the state Tax Department, sat through debate on several bills, just in case the committee had questions for the department. She multitasked on her laptop in the meantime. “We try to monitor the money committees,” she said. Jeanne Kennedy, a lobbyist who represents the Consumer Data Industry Association, waited for a telecommunications bill due up next. She decided to be there in person to hear it called, rather than risk missing it. “They’re always updating the schedule,” she explained. Todd Bailey, a lobbyist with Leonine Public Affairs, had been hired by Lyft to follow the insurance bill even though the company does not yet operate in Vermont. He tucked his 6-foot, 4-inch frame into a chair on the far side of the committee room, an iPad in one hand and water bottle in the other. Fortunately for Bailey and his fellow lobbyists, these committee chairs have padding on the seats. They have no way of knowing how long they’ll be there. 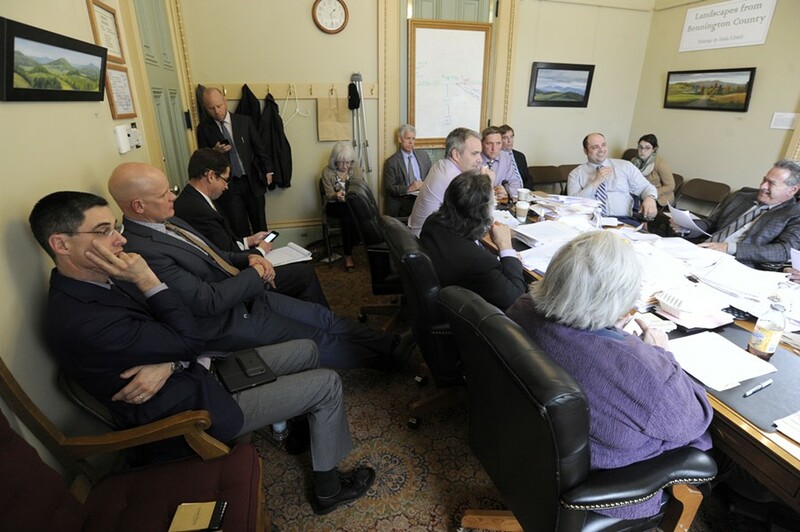 While the lobbyists in the room were well-versed on the legislation at hand, the committee members were like freshmen on the first day of a class called Auto Insurance 101. “Thank you all for opening up this can of worms,” Cummings quipped as she tried to keep up with the lingo. The House had come up with a bill that would mirror insurance requirements for Uber and Lyft drivers in some 45 other states. But the Senate Judiciary Committee had asked for more insurance coverage and background checks for drivers. Before figuring out whether to regulate how much insurance an Uber driver needs, however, committee members grappled with learning about how traditional taxis are governed. It quickly looked as if a bill that had traveled through three other legislative committees could die right then and there simply because there was so much the committee didn’t know. Sen. Dustin Degree (R-Franklin), the lone Republican on the panel, argued that the legislation’s impact was too widespread to finish this year. “I think this is bigger,” he said. “In the meantime, you may have people riding around uninsured,” Cummings responded. Adam Necrason, a lobbyist with the Necrason Group who represents trial lawyers, made a rare appearance in the committee witness chair. Necrason usually instructs his clients to speak for themselves, but because it was late in the session and the schedule was shifting quickly, he stepped in to argue for the higher standards Senate Judiciary sought. He urged the committee to think about a young girl crossing the street in front an Uber driver checking his phone app for potential riders. Typical insurance would pay only $50,000 toward catastrophic injuries for such victims, he said. “You quickly get to the public taxpayers to care for them,” he said. Cummings hesitated. They needed to hear from a slew of people who weren’t in the room, including Burlington city officials who already regulate Uber drivers, state insurance regulators and the Judiciary Committee. “I suppose we can put this bill off until tomorrow,” she said. The same crew of lobbyists would be back in their chairs lining the room. They couldn’t afford not to be.